Three new energetic agents were synthesized using 3,5-dinitro-4-chlorobenzonitrile, sodium azide and hydrazine, which were 2,6-dinitro-4-cyano-azidobenzene (I), N-2,6-dinitro-cyanophenyl-hydrazine (II) and bis-N,N′(2,6-dinitro-4-cyanophenyl)hydrazine (III). These energetic substances were first characterized by elemental analysis, IR, mass, 1H NMR and 13C NMR spectroscopic methods. The energetic substances were studied by thermogravimetry, and it was understood that the mechanism of the thermal decomposition reactions consists of two successive exothermic thermal reactions. In the first thermal reaction, the energetic material was converted to furoxane compounds, and then, these furoxane compounds were decomposed by the second thermal reaction. 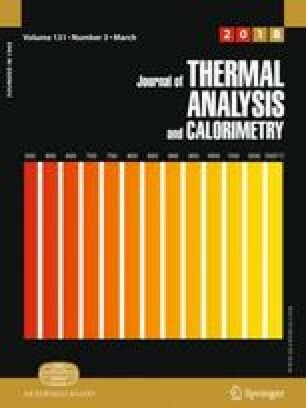 Activation energies and Arrhenius pre-exponential factors of thermal responses were determined by using isothermal (Coats–Redfern) and nonisothermal/isoconvertional (Kissinger–Akahira–Sunose, Ozawa–Flynn–Wall) methods with thermogravimetry and differential scanning calorimetry (DSC) data. With these calculated values, other thermodynamic parameters reaction enthalpy, entropy changes and free energy were calculated. Formation enthalpies of the elements of the energetic substances were theoretically calculated using the CBS-4M algorithm in the Gaussian 09 program for the synthesized energetic substances. In the thermal decomposition reactions, the products were estimated with the aid of literature data and the enthalpies of explosion reactions were theoretically calculated according to the Hess Law. Besides, the exothermic energies in the first and second thermal reactions of the energetic substances were measured by DSC. The results measured by DSC were compared with the calculated theoretical results and were found to be very close to each other. In the study, antimicrobial activity was estimated to be high because energetic molecules are strained molecules, and it is possible this tension can affect the medium. According to this thought, antimicrobial activity was determined by using five different bacteria and a fungus. Antimicrobial activity values were determined by “agar dilution” method, and results were found as minimum inhibition concentration. Among the three energetic substances, 2,6-dinitro-4-cyano-azidobenzene was found to have the most active compound. This work was supported by the Scientific Research Fund of the University of Ankara (project no. 16H0430004) and Scientific Research Fund of the Ahi Evran University (grant no: FEF.A4.17.001). Gaelle DSY, Yufanyi DM, Jagan R, Agwara MO. Synthesis, characterization and antimicrobial activity of cobalt(II) and cobalt(III) complexes derived from 1,10-phenantroline with nitrate and azide co-ligands. Cogent Chem. 2016; Article number: 1253201; doi: 10.1080/23312009.2016.1253201.